March 2018 Blog Commenting Report ~ 88 readers made 161 comments! 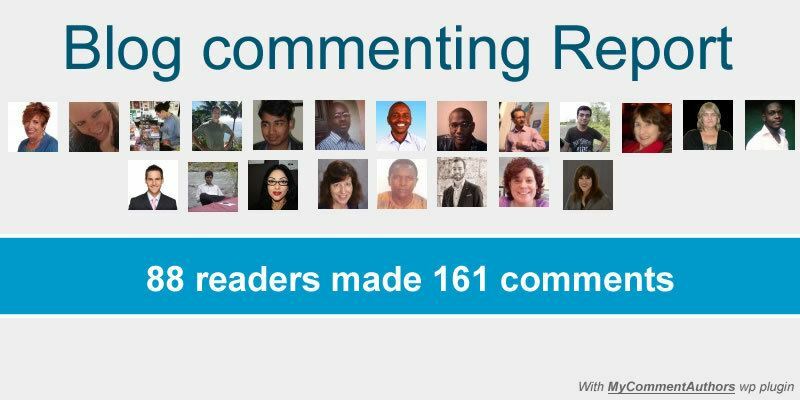 →March 2018 Blog Commenting Report ~ 88 readers made 161 comments! It’s another new month to read articles and leave useful comments everywhere. On this blog, we had an exciting month of March. There were many of you who read my blog. 88 decided to drop at least one comment. In total, we had 161 comments. This is beginning to get exciting. In today’s post, I’m simply posting a list of my comment authors with a count of the number of comments they made and of course a backlink to their URLs. NB: If you run a WordPress blog, you can get the very simple plugin here to help generate the list of your comment authors. Read more about the plugin on this post. I made 23 awesome comments. Hello, My name is Freddy G. Cabrera. I dropped 11 awesome comments. I made 11 awesome comments. Hello, My name is Anil Agarwal. Hi, My name is Moss Clement. Hi, My name is Qhubekani. Hi, My name is Mark Newsome. Hello, My name is Abioye. Hi, My name is Vishwajeet Kumar. Hi, My name is Philip Verghese Ariel. Hello, My name is Jamaley Hussain. Hello, My name is Lorraine Reguly. Hello, My name is Fred Wilson. Hi, My name is Babanature. Hello, My name is Donna Merrill. Hello, My name is Aderemi Dare. Hello, My name is MP Baruah. Hi, My name is Yasar Ali. Hello, My name is Paul. Hello, My name is Susan Velez. Hi, My name is Monika Sharma. Hello, My name is Moris. Hi, My name is WALLY. Hi, My name is Ernest. Hello, My name is Aminu. Hello, My name is Danny. Hi, My name is ceogeneral. Hello, My name is Kim George. Hello, My name is Emenike Emmanuel. Hello, My name is Udit Khanna. Hi, My name is Marcin Led. Hi, My name is Moss. Hi, My name is suraj kumar. Hi, My name is puspendu. Hello, My name is George. Hello, My name is Aashrit. Hi, My name is md kafilur raheman. Hi, My name is Naveen Sharma. Hello, My name is michaeltim. Hi, My name is Fouad Atitebi. Hello, My name is Johnson. Hi, My name is tracy collins. Hello, My name is Shaon adnan. Hi, My name is Mathew Adams. Hi, My name is Gorge. Hello, My name is Cori Ramos. Hi, My name is Lisa P Sicard. Hello, My name is Sadhan Pal. Hello, My name is Jones. Hello, My name is Melika. Hello, My name is sokolartnau. Hello, My name is Mat Boye. Hi, My name is Bren Pace. Hi, My name is Lisa Sicard. Hi, My name is Ali. Hi, My name is Rahul Kuntala. Hello, My name is Scott Bumgarner. Hi, My name is Istiak Rayhan. Hi, My name is Battulal. Hi, My name is Luis @ Tech Pilipinas. Hello, My name is Raj Asawa. Hello, My name is Blessing Bethel. Hello, My name is Rambharat singh. Hello, My name is Henry. Hi, My name is Vikas Pandey. Hello, My name is Matt. Hello, My name is Amy Leonard. Hello, My name is Darleen Prague. Hi, My name is Aditya. Hello, My name is Asaolu olubayode. Hi, My name is Saayed. Hi, My name is Dascoin. Hello, My name is ANAND. Hello, My name is Deepak Agnihotri. Hi, My name is Dave M..
Hi, My name is Genard Hernandez. Hello, My name is piyush. Hello, My name is Smith Watson. Hello, My name is zeeshan. Hi, My name is Fayyaz Ahmed. Hi, My name is Melos. Hi, My name is Birchi. I want you to be featured on this list for the month of April. So just drop a reasonable comment below or go through my blog and comment any article of your choice. Thanks a lot for mentioning me. I am happy that I can help you. Your blog posts are always very informative and help others. Just keep it up. Thanks for being part of it bro. There are better days ahead so let’s keep giving. Thanks for you mention me on this list. Your Post is really informative and useful.Your Post on Getting web traffic and SEO is very useful for me, before visiting here I don’t know lots of things So thanks and keep posting such a wonderful article. What a pleasant thing to be here again to note the wonderful mention of your esteemed readers’ comments. Happy to be part of this wonderful plugin from the beginning. I am so glad to note that I too published my esteemed reader’s comment report just the other day by using your wonderful plugin, MyCommentAuthors. Thanks again Enstine for your wonderful efforts to get engaged with your readers. Hey Enstine! You’re rocking it, my friend! Keep up the good work! I am very glad to know that you have also mentioned the name as a blog comment in your blog commenting report. Thankyou very much & keep up the good work. Thanks for coming here again. You will be on the next list. Hi Enstine, Thank you again for bringing this plugin to my attention again. I really enjoy sending my readers a little note of thanks for their visits and comment. I got an email from you, for thanking me to come on to your blog and reading your blogs. I am very very thankful to you to publish such amazing content which really helps us to grow and widens our horizons. Really appreciate it. Thank you so much Enstine. First of all, thanks for mentioning me above with all the other awesome bloggers. I appreciate it. Also, I was surprised when I received an email from you thanking me for taking the time to leave a comment. I am going to have to take the time to check out that plugin. I can definitely see the benefit of taking the time to thank people for leaving comments. That’s one of the reasons that I love using WordPress. There are so many plugins that we can use to help us improve our blogs. Plus it’s a great way to increase the engagement on your blog and build community. Which is what we all really want with our blogs. Thanks for being an awesome person on my blog. As a matter of fact, the email you got was sent using the plugin. It’s an inbuilt system to send alerts only to those on the list. I will be excited to see it at work on your blog. As you already demonstrated knowledge on how this can boost engagement, let me know if there is anything I can do to help set the plugin up. Remember it has absolutely no negative impact on your blog. I’m glad I was able to make it 3 times last month. You are the best blogger, Keep on rocking.